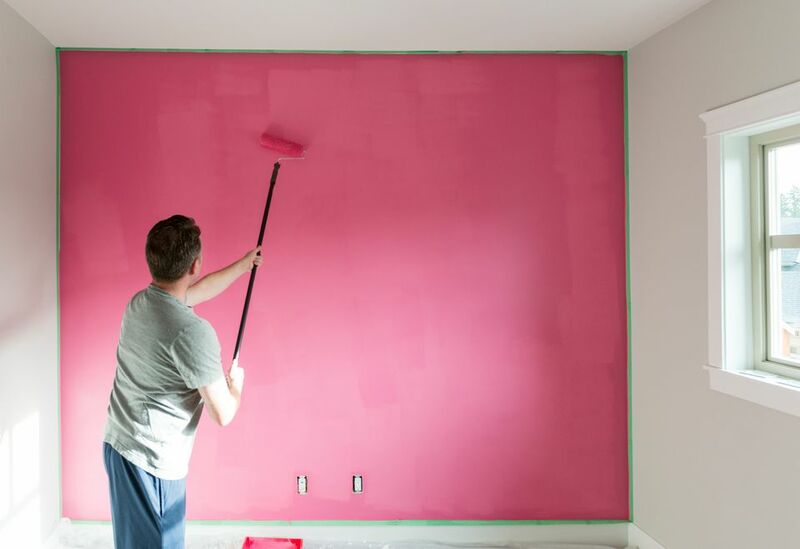 Painting your walls might seem like the most elemental home remodeling task, a project that amateurs can perform just as easily as professionals. While interior painting does not rise to the level of skill-heavy jobs like electrical work or plumbing, not everything about painting is abundantly obvious. Over the years, professional painters develop certain procedures that make their jobs go faster, look better, and finish cleaner. By adopting professional painters' methods and insider tricks, you too can turn out a fantastic wall paint project. After the plates have been removed, place tape over the remaining switches and outlets to avoid slopping paint on them. On an 8-foot by 15-foot wall, you can expect to finish taping crown molding, baseboards, one door, and one window in about a half hour. Purchasing low-quality paint seems like a great idea on paper, but not so much when it's on the wall. Poor paint requires multiple coats and it might still end up peeling and chipping on you. Because interior walls are so visible, many homeowners find it worthwhile to buy top-quality paint, even when the price is higher. Larger Rollers: Speed up your rolling time by 50 percent by using wider roller frames and covers. The most popular width on the consumer market is 12 inches because it is easier to handle. But if you are strong enough, using an 18-inch roller will considerably speed up your painting. If you are painting many walls, it will be worth it to use a larger roller. But for just one or two walls, use a conventional 12-inch roller. Masking Film: Professional painters often use plastic masking film to cover adjacent walls, ceilings, and windows. Static electricity holds this super-thin plastic to the surface. Some masking film comes with an attached edge of painter's tape. Canvas Dropcloth: Plastic sheeting is fine for covering furniture and other areas where you will not be walking, but for underfoot, a canvas dropcloth provides a more solid place to stand. In addition, it can be reused. Few pro painters will be found without a set of work lights. By shining them on the wall you are painting, you get a clear visual of how well the paint is going on. Ceiling lights will not do the job. A couple of LED work lights, each rated at 4,000 lumens and found at your local home center, are an inexpensive way to shine a white, color-correct light on your wall. Run long, uninterrupted strips of painter's tape along the juncture between the wall and ceiling, wall and adjacent walls, and along the top of the baseboards. If the wall has a door or window, run the tape around the door or window trim. Professional painters, though, tend to use the freehand cutting-in method. This tape-free procedure requires a steady hand and a trim brush. Paint a 4-inch swath along the edges with a 2-inch trim brush by dipping the brush lightly into the paint can, wiping off the excess, then painting alongside and slightly on the painter's tape. If using the cutting-in technique, paint the edges about 4 inches inward, as well. With either method, paint at least two coats. You do not always have to use primer when painting a wall. This is particularly true when you are re-painting a wall the same color, and the existing paint quality is good. Always use a drywall primer when the surface is bare drywall paper. Professional painters often request the paint store to pre-tint the primer to bring it closer to the intended wall color than stark white. This reduces the number of color coats needed. With the edges dry (wait at least a couple of hours), roll the inner part of the wall. Dip the roller in the tray and thoroughly squeeze it out by rolling it on the tray. Place the roller on the wall and paint in "W" shapes in order to fill small sections of about 4 feet high by 4 feet wide. Finish a section before moving onto an adjacent section. Quickly work so that you maintain a wet edge. Make sure that you are always working off of a wet edge. After the wall is finished, wait at least a couple of hours. The glossier the paint, the longer the dry time. Flat paint can be ready for re-painting in as little as an hour in dry, warm conditions. Clean up your brush with warm water and a paint comb, provided you are using acrylic-latex interior paint. Remove dropcloths and let them air-dry over a fence outside. Wad up plastic sheeting and throw away. Wait until the next day to remove the painter's tape. Pull straight back to cut the paint and create a line.